Despite the somewhat literal and unimaginative title, this recent release is a really a very interesting documentary study of John Lennon and Paul McCartney’s careers immediately following the break-up of the Beatles. I’d read about this DVD by chance and had been looking around on Ebay for a copy. I dropped in to my favourite shop – Red Eye Records – and there it was on the shelf for a reasonable price. Well, reasonable compared to the prices I’d seen for British or US copies on Ebay, plus postage, plus the uncertainty of “will it ever arrive?”….a bird in the bush as they say. So, I got it at Red Eye, and watched it last weekend – which was a wet weekend and perfect for being a couch potato and settling in in front of the TV for a couple of hours. Nicely put together, it traces the first few years of Lennon and McCartney trying to make their ways as solo entities outside the protective shell that used to be the Beatles. It compares them as composers and performers, examining their early singles and album releases. 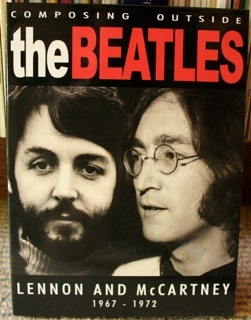 There is much more time and effort during the documentary placed on John Lennon’s output than that of Paul – but this is probably because the overall theory of the documentary is that Lennon was by far doing more serious and worthy work, and being more commercially successful than his former band-mate and co-writer. There are nice shots of original album covers and single releases as the discussion panel (which includes Klaus Voorman, Paul Gambaccini, drummers Alan White and Denny Seiwell, and writers Johnny Rogan, John Blaney and Steve Turner amongst others) commenting on and appraising the relative strengths and weaknesses of each solo release between 1967 and 1972. 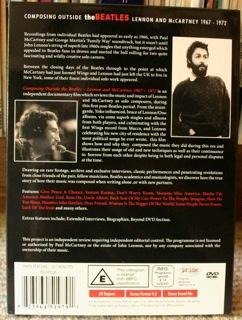 The front cover of "Composing Outside the Beatles"
The packaging of the DVD is impressive. It’s in the digi-pack style with opening “pages” revealing the DVD disc inside. It is glossy and has good production values with great photos and printed information. The rear cover of "Composing Outside the Beatles"
So, “Composing Outside the Beatles” really has a strong slant towards John – both in the comments by the interviewees and the ratio of time spent on each. But maybe this is just a reflection on the times where Paul was struggling to be a musician outside the Beatles while John appeared to leap into it with a bit more style (as well as critical and commercial success). If you are interested there’s a further review here. 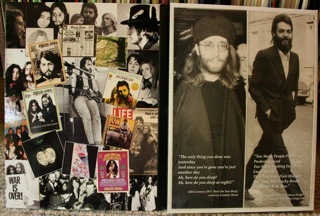 This entry was posted in Beatles, Beatles Collecting, Beatles Music, Beatles Related, Beatles related DVD, John Lennon, Paul McCartney, Plastic Ono Band, Uncategorized, Yoko Ono and tagged Apple Records, Beatles, Beatles Collecting, Beatles DVD, Beatles Related, John Lennon, Klaus Voormann, Music, Paul McCartney by beatlesblogger. Bookmark the permalink.